The TechHive Lab loves to test out new products but sometimes, for one reason or another, products just can’t be tested on site. In these rare cases, we’ve been known to make house calls. And if anything is going to coax lab guys out of their shelf-heavy space, its a 100-inch television lit with frickin’ lasers. The other day, LG invited us to enjoy some hands-on time with its new, massive, laser-lit TV and we jumped at the chance to check it out. Not your typical set, the LG 100-inch Laser TV—aka Hecto—actually comprises an ultra-short throw DLP projector and a special 100-inch screen. Hey, that's a big screen! Shown for the first time at the 2013 CES, this $9000 behemoth is now available at select AV specialty vendors like Stereo Advantage and P.C. Richard & Son. First off, the DLP projector fills the 100-inch screen from a mere 22 inches from the screen. It offers 1080p resolution and 150 nits of brightness—not as bright as most standard TVs, but enough to be watchable under daylight conditions. Instead of the standard lamps typically found in projectors, LG uses laser diodes that the company claims will last up for up to 25,000 hours—much longer than the 2000 hours to 3000 hours of life provided by conventional lamps. The laser diodes warm up quickly, too. We watched the Hecto go from off to full brightness in about six seconds. The second half of the equation is the specially designed, all black screen. It measures 100 inches diagonally, but the screen is less than half an inch thick and weighs a relatively floaty 70 pounds. It’s made up of a six-layer, anti-glare screen that helps to absorb ambient light while reflecting the light from the projector straight out. We brought out own files with us and looked at a variety of different items—football footage, scenes from The Dark Knight, test images, and a few other things from our HDTV test bed—in a variety of different lighting scenarios and found the screen did an respectable job of blocking glare. A lamp overhead in the conference room in which we were sequestered was very noticeable when turned on, but that’s something a person could easily avoid in a home theater environment. Checking out our football footage on the screen. The recommended viewing distance is one and a half times the screen’s diagonal measurement, so about 12 and a half feet from the screen. The TV’s projected image definitely appeared less bright as I moved far left or right of center from the screen, but the sweet spot was certainly large enough for most home theaters. The projector’s built in speakers are convenient and sounded decent, but if you’re buying a $9000 television, you probably won’t be satisfied with the sound. Getting content on the 100-inch Laser TV should be no problem. The set has three HDMI ports; USB in and out; ethernet; and VGA and component inputs. It also has built in Wi-Fi, supports WiDi, and with LG’s SmartShare application, you can stream content from your iOS or Android portable devices. 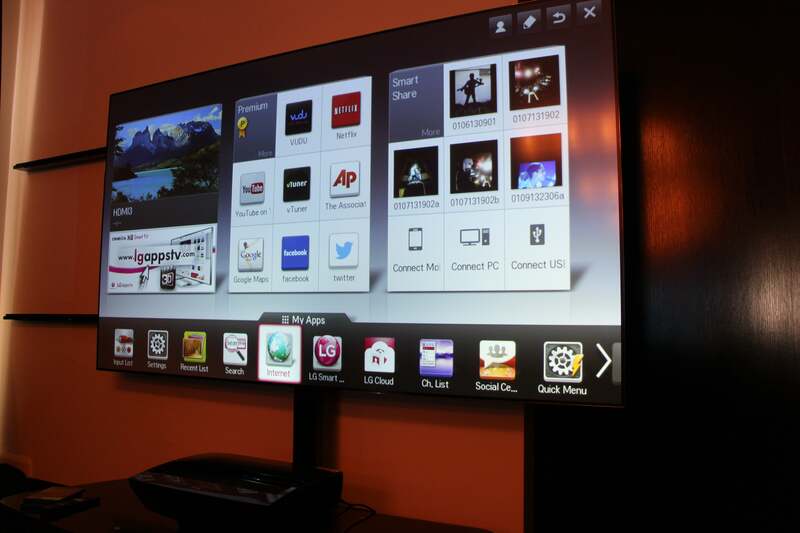 And it also supports LG’s Smart TV features, which lets you stream Hulu Plus, Netflix, YouTube, and other content, as well as surf the Web. The Hecto offers the same content options as LG's 'real' TVs. While I’d recommend professional installation, two ambitious do-it-your-selfers should be enough to set up the 100-inch Laser TV. The 30-pound projector piece needs to be exactly 22 inches away from the screen and exactly 15 inches below it. If you want to mount the projector on the ceiling you can, but the screen will also have to be turned upside down. The TV has built in calibration tools to help align the image on screen, auto keystone correction, and a couple of expert modes for tweaking the color. The colors in Cinema Mode were a touch yellow by default, but with 20 point IRE white balance adjustment and a color management system just like premium HDTVs, this shouldn’t be difficult to correct. While we weren’t able test this head-to-head with other TVs or projectors, we found the TV’s projected images to be sharp. Text was very legible on both our test screens and scenes, and motion as smooth as many 600Hz Sub-Field Drive plasmas TVs we’ve tested. The Hecto’s 100-inch screen size and $9000 price tag won’t fit most people’s living rooms or budgets, but for those with the space and the cash, the LG Hecto is pretty cool in both size and in function.